I received this from Penguin (with thanks to LoveReading) in exchange for an honest review. As always, my reviews are fair and non-bias. With the Wife Project complete, Don settles happily into a new job and married life in New York. But it's not long before certain events are taken out of his control and it's time to embark on a new project . . .
definition: a "speed review" is a new meme on Pretty Little Memoirs, specialized for short reads, galley copies, reviews for lovereading.co.uk or novellas! With thanks to Lovereading.co.uk and Penguin for the copy of The Rosie Effect for review! First thought when this arrived in my mailbox: YAY, YAY, YAY! The Rosie Effect is the immensely and highly anticipated sequel to The Rosie Project. I thoroughly adored The Rosie Project last year and as anyone who has read the book will know, it's pretty unique. Don Tillman is quite the inimitable character as we learned in his Wife search in book one, when he found the woman he would love called Rosie in his "Wife Project". Now married to Rosie in a lovely ceremony and then living in New York, Don is slowly adapting to his new life. That's until Rosie drops the unexpected news that she's pregnant, and it shatters Don's plan for the near future. So armed with this new news, Don has to rethink everything he planned for him and Rosie, creating a whole new project for him to focus on that inevitably starts one of the best novels I’ve read this year. Don and Rosie really are the most hilarious, unique and fun characters in a book you’ll find. They'll have you in hysterics, then crying, and then laughing again. 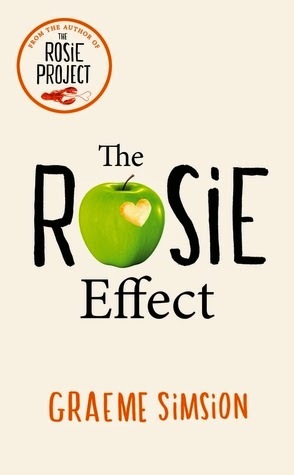 The Rosie Effect was the perfect addition to The Rosie Project and I can't wait to read more from Graeme Simsion's witty, imaginative writing style. A marvellous, incredible story that will be top of everyone's to-read list! You'll fall for Rosie and Don time after time. 5 stars doesn't cover it. Have you read The Rosie Effect?